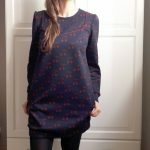 Everything you need to know to sew Ortense dress! Pattern of the pockets (see drawing or OLGGA skirt pockets’ pattern, for those who have this pattern). Here I give you some indications but it is not necessary that the curve is absolutely identical. 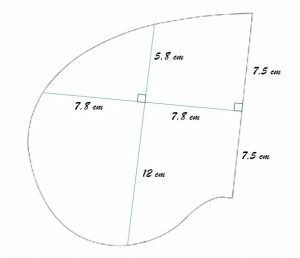 Extend the Front by 20 cm (7 7/8 in) as describe. Draw a perpendicular to this new line. Extend the side, following the initial angle. You can slightly round the bottom of the new piece as describe, but it is not a requirement. 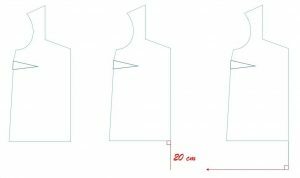 Shorten sleeves by 2 cm (13/16 in). Cut all the pieces in your fabric. Caution: you need 4 pocket pieces. Follow instructions of the Ortense blouse pattern. There are no buttons on the dress I have sewn, so I cut the front and back yokes in one piece each. 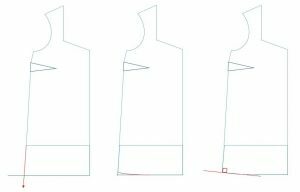 Before overcasting and closing the dress sides, sew pockets pieces on the Front and the Back, right sides together (see drawing). The top of the pocket is about 30 cm (11 13/16 in) away from the bottom of the dress (without the band). Make sure to position your pockets pieces so that the front pockets will perfectly face the back pockets. Overcast dress sides + pockets. Place Front and Back right sides together (pockets out). 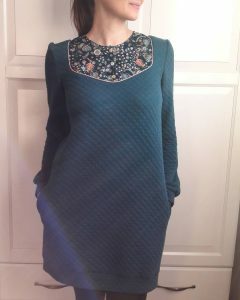 Sew in two steps: From the sleeves edges to the pockets, and then from the pockets to the bottom of the dress. 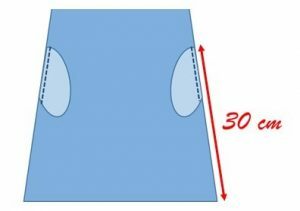 Dress seams must overlay pocket seam ends on 1 cm (3/8 in) (see drawing). Sew the pocket pieces right sides together. Sew the dress and sleeves bands as indicated in pattern instructions. Follow the last pattern instructions to finish your dress. There you go, your dress is ready! I hope you enjoyed this tutorial! Hello, my name is Maud! I create with passion the Anna Rose sewing patterns! On the blog, you can read about the rise of my patterns, their different versions and hackings.